Boston Tours & Ticket Center. 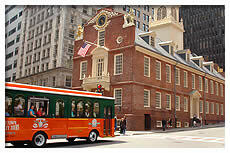 Your Ticket to Boston's Old Town Trolley tours, sightseeing, attractions & discount tickets. The original Old Town Trolley Tours was conceived right here in Key West. It was more than 25 years ago when the three founders of Historic Tours got together to work towards preserving the historic sites of the city and along the way, created an exciting and entertaining sightseeing tour. Hop aboard the city’s most enthralling Boston sightseeing excursion, Old Town Trolley Tours of Boston! The orange and green trolleys have been providing guests with Transportainment for more than 25 years. Old Town Trolley is the best way to relive history and see all our country’s Cradle of Liberty has to offer. While on board Old Town Trolley Tours of Boston, you’ll feel as if you’ve journeyed back in time to the era of the first colonists. Imagine how Paul Revere felt when he made his historic “midnight ride”; hear tales of how he and other famous settlers fought for freedom. As the Old Town Trolley makes its way throughout the city, you’ll have the freedom to get off and back on as often as you wish; and there’s always another trolley coming along soon. Boston tours aboard the trolley is the best way to see the sights in the city. See ancient burial grounds, national historic landmarks like the Old North Church and the Old State House and many of the moving monuments in Boston like Bunker Hill and the site of the Boston Massacre. 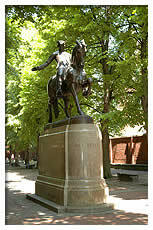 Experience the magnitude of what our forefathers suffered through as you walk along the Freedom Trail. Boston’s critical place in the history of our country is evident in the many sights you’ll see on the Old Town Trolley Tour. You can also hop off the trolley to visit chic shops, museums, fine restaurants and the famous pub that the TV show “Cheers” was fashioned after. There’s so much to do and see in Boston and we’ll help you discover it all in a comfortable, relaxing, informative tour. Our expert conductors make the ride even more enjoyable as they delight guests with humorous stories and historical facts about the many points of interest along the way. One of the most important places in the USA’s past and present, Boston is steeped in history and culture, offering an array of exciting activities and intriguing attractions. And on board Old Town Trolley Tours, you’ll get an up close and in-depth look at it all. So when you’re ready to see everything from Faneuil Hall to the Boston Harbor and everything in between, take your seat on one of our orange and green trolleys. Boston is home to the nation's first public park (The Boston Common 1634 ), the first public library (1653 ) and the first subway (1897 ). *Applies to standard ticket. Boston Harbor Cruise is available to purchase at ticket booths only. Ticket must be purchased by October 31, 2019. Ticket is non-transferable. Other restrictions may apply. Extra days or free portion of the ticket has no cash value and is not refundable and non-transferable. 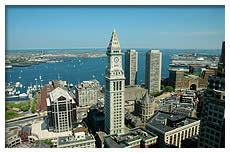 Learn more information about Boston Tours. In Season: April - November. Come when there’s a cool breeze in the air or even during the dog days of summer, either way you’ll feel an eerie chill run up your spine.